To audition these artists for your event, select one of the songs from the set list below the music player. If your Special Event requires ethnic music to create the atmosphere you seek, SeaSoundStudio ENTERTAINMENT represents Soloists, Duos, Trios, Quartets and Bands. Our musicians and bands can accommodate your needs by performing any style of world music. Certain musicians are highlighted below, but contact SeaSoundStudio with your specific entertainment need because we have access to a large network of musicians in addition to those identified on this page. Those musicians include a Mariachi Band--a traditional Mexican band playing several guitars (one of which is called a vihuela, a high-pitched 5-string guitar), a guitarron (acoustic bass), violins, trumpets and occasionally a harp or accordion. SeaSoundStudio ENTERTAINMENT can also arrange for the following bands: Caribbean Steel Drum Band; Italian Band; Greek Band; Irish Band; German Band; Hawaiian Music; Scottish Bagpipes; and Celtic Pipes. 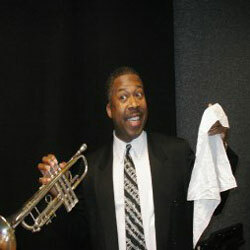 Ramon Kenan, "The Satchmo Show"
The Satchmo Show, starring Ramon Kenan, provides a multi-dimensional experience for both children and adults: it is educational, inspirational and entertaining. With his trumpet, vocal skills and acting, Ramon Kenan portrays the legendary Jazz figure, Louis Armstrong, through a vibrant performance about Armstrong's life and his influence on an entire generation of artists. The show can be expanded from 45 minutes to 90 minutes with a quartet of instrumentalists. If you are interested in the show, and you would like the musicians to extend the time of their performance, contact SeaSoundStudio ENTERTAINMENT. For more information about Ramon Kenan, click on his picture or here. Piccolo Mondo is a musical group that prides itself on its ability to play music originating from diverse cultures around the world. 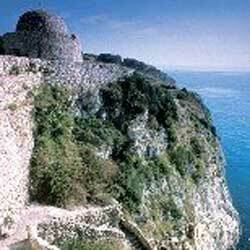 Piccolo Mondo can play Irish Pub Songs, Greek Dance Music, Romantic Italian Love Songs, German Music, Lively Latin Music and French Cafe tunes. This group features the following instruments: Guitar, Clarinet, Violin, Bouzouki and Accordion. Some of the songs played by Piccolo Mondo include: Al Di La, Besame Mucho, Can Can, Cielito Lindo, De Colores, Du-du liegst mir im Herzen, Hanschen klein, Irish Rover, La Bamba, La Mer, La Vie en Rose, Wooden Heart (Muss I Denn), Never on Sunday, Santa Lucia, Tarentella, Whiskey in the Jar. If you are unable to find a band that is familiar with a particular type of ethnic music that you desire at your special event, contact SeaSoundStudio ENTERTAINMENT for more information about Piccolo Mondo. Based on the music of their Irish sibling band, The Corrs, Spancil Hill is a group of four talented musicians who provide a beautiful blend of traditional melodies with lush harmonies and instrumentation. Spancil Hill provides a fresh look and sound to the North Carolina entertainment landscape. 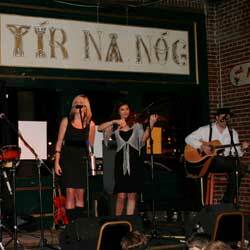 The group has a Celtic pop sound that easily sets it apart from other area bands. Although they are especially popular performers for Irish-themed events, their musical repertoire ranges from traditional Irish folk and instrumental tunes to a variety of current pop and rock selections as well as Christian Music. For more information about Spancil Hill, click on their picture or here. 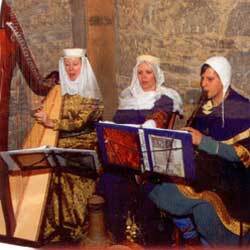 The Merry Minstrels perform Medieval, Renaissance and Celtic traditional music in period costumes on reproduction instruments of the period. Their merry music includes jigs, reels, ballads, Gregorian chants, troubadour love songs and dances using harp, recorder, krumhorn, guitar, psaltery, penny whistle and hand drum. For more information on the Merry Minstrels, click on the picture or here.